My friend is a mermaid. She admitted this as we were walking from that Church in Matinloc, Zambales. Yes, she has legs when she’s on land, but once she dips into that big fish tank at the Manila Ocean Park, she grows fins and flowers and floats around gracefully to a beautiful orchestaral arrangement of Abba’s Dancing Queen. 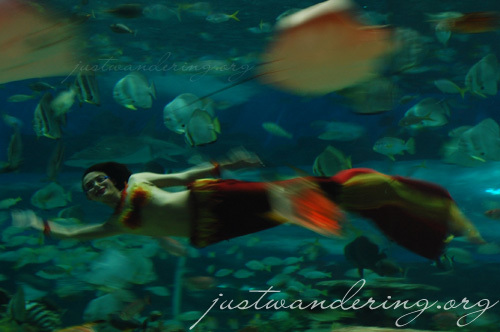 The mermaid show is one of the unique attractions that the Manila Ocean Park offers its visitors. Thanks to our mermaid connection (Hi Ida! ), we were extended an invitation to tour the park. I’ve been to the MOP twice before, but never to the park itself. That’s what I love about the Manila Ocean Park — you can enter the building, dine and lounge at the restaurants and cafe without having to pay the admission fee. Going into the oceanarium didn’t really interest me as I figured it’s going to be the same as the other aquariums I’ve been to. In essence, it is, but the main difference is that the ocean park features marine life that you can find in the Philippine seas. Admittedly, my favorite tank is this empty tank filled with unfiltered water from Manila Bay. It’s dirty and murky, but believe it or not, it’s the same water (though heavily filtered) that keeps the fish alive inside the aquariums. There is hope yet. It’s a live baby shark! 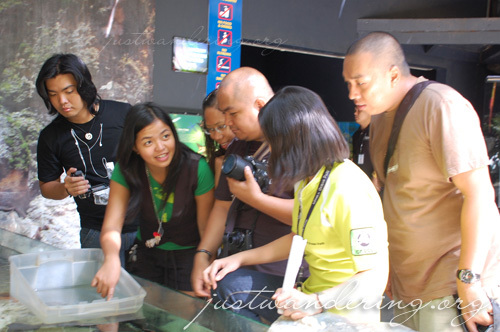 Outside of the aquariums, there are still activities that are fish related. Like going on the glass-bottom boat ride around the tank. Here, you get a clear view of the fish from above, and you might even be greeted by an aggressive little fish giving you the evil eye because you’re invading their territory. Sorry, Mr. Fish. Another must-try experience is the Fish Spa. Take off your shoes, roll up your pants and dip your weary feet inside this pool teeming with Dr. Fish, all eager to nibble away on dead skin cells. It’s quite ticklish at first, but as soon as you get used to their nibbling, it’s fine. It’s an unforgettable experience (especially if you’re with someone who’s very very ticklish) for only Php 120. 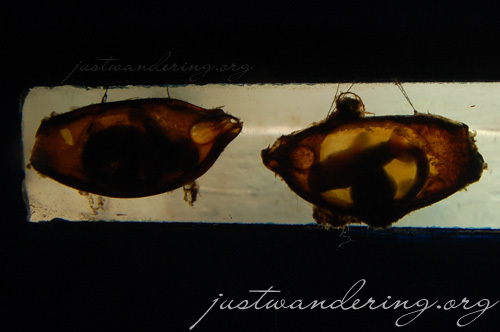 One of my favorite part of the aquarium is the Jellies Dancing Fairies exhibit. 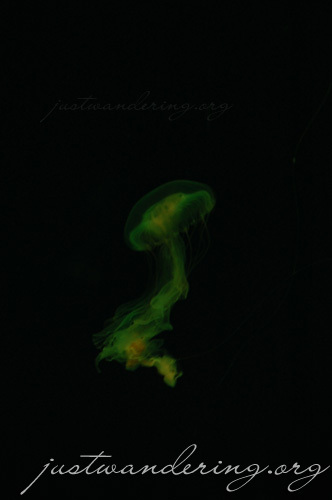 Imagine a room lit only by changing lights inside the jellyfish tank, with beautiful swirling translucent stingers float around to Pachelbel’s Canon in D. The lighting, music and the movements of the jellyfish make for a very relaxing tour. The highlight of the tour of course, are the mermaids. From Tuesdays to Sunday at 10:30am, 3pm and 4pm, these mythical creatures delight guests as they swim around with the fish inside the aquarium. They can be seen from inside the tunnel through the tank, but the best views are on the other side, in the function room where the lights and seats are. After each show, you can have your picture taken with the mermaids, as they gamely pose for the cameras from within the tank. What’s a tour without copious amounts of food? We capped the tour with a sampling of Singaporean favorites at Makansutra, the Asian food village. Set up to mimic hawker centers in Singapore, each “stall” features specialties like Bak kut teh, char kway teow, fried prawn hokkien mee and the popular Singapore chicken rice. If you’re in the mood for something more familiar, restaurants like the Pancake House, Gerry’s Grill and the San Miguel Cafe can be found in the premises. All of the restaurants face the bay, so you can enjoy the spectacular Manila Bay sunset as you dig in to your meal. The Manila Ocean Park is open everyday from 10:00am to 7:00pm on weekdays and from 9:00am to 8:00pm on weekends and public holidays. Entrance to the Mermaid Theatre for the mermaid show is free with every purchase of the Oceanarium ticket (Php 400 adults, Php350 kids 4 feet and below). Manila Ocean Park is a great place where we can enjoy with our friends and family. A place where we can be proud of it. ok, naalala ko na ang additional info. Ako man, di ko kinaya ang comment, Chyng! Thanks for the info about Ozeano! Wooooah. I love aquariums…only because they don’t smell as much as the zoo. Isn’t this aquarium supposed to be huge? How long did it take you to view most of the exhibits. Also, what’s your favorite part of the place? My family has been there, but I’ve never been. It would be nice to visit our friend the mermaid! how much is the entrance fee at the manila ocean park? Hi! If you don’t mind, can I ask for your mermaid friend’s multiply/fb page or any means to contact her? I wanted to ask her some things like is there a swimming class/school where I could learn ‘mermaid strokes’ and basic synchronized swimming skills,etc. I’ve been into mermaid-ing since late 2010 but being into mermaids, tails, swimming,etc started when I was a kid. And I wanted to develop more skills needed for me to ‘practice’ this mermaid-ing passion in a more productive/seriousway. I hope you could find time to reply.